Lolly posted these questions for Socktoberfest, and I hadn’t gotten around to answering them yet! Here is my extremely brief sock-knitting history. The first pair of socks I knitted was for a belated Christmas gift last year (so, January-ish), using worsted weight wool from Belle Valle Wools (an Ontario sheepswool producer). I had my sister around, thankfully, to help explain the heel-turning part, because it really did confuse the heck out of me. I still have a skein of this yarn in grey and am hoping to knit a pair of mitts with it this winter. 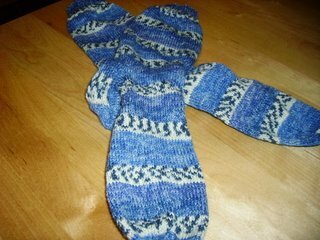 The first pair of socks I knitted for myself, and the second pair I ever made, used a free pattern from Patons yarns and was made on 68 sts using 2.75mm needles, with Fortissima Colori self-striping yarn. I still have 2 balls of this yarn in a slightly lighter colourway, and they’re waiting to be turned into a basic pair of stockinette socks as soon as I finish the current Pomatomuses (Pomatomi?). The first pair has held up well, but they’re just slightly brighter than what I normally wear, so if I wear them at all it’s with jeans. I would have used slightly fewer stitches. I seem to like the 64 sts on 2.75 mm needles for my feet, it’s worked out well for the basic pairs that I’ve done, although I do wonder if I could go down to 2.25mm needles on the same # of stitches, for my feet. For basic sock yarn, I quite enjoy Patons Kroy. It feels nice in my hands as I work, and while it doesn’t come in a huge # of colours, I do like the colours it comes in. I’ve knitted 3 pairs of socks using Kroy so far, and have 2 balls of black lying in wait. I’m still deciding if I want to just do basic black stockinette (because who doesn’t need black socks, I ask you?) or to try something with a bit of a pattern, like Jaywalkers or Baudelaire. I have a pair of skeins of Lorna’s Laces Shepherd Sock (my first LL purchase – Black Purl colourway for those curious) also waiting to be turned into something. I already love how it feels in my hands. Honestly, though, after I read “Knitting Rules” by Stephanie Pearl-McPhee, her chapter on socks made a world of difference to me. Now I understand sock principles and I just go ahead on basic ones without worrying about the pattern. Heel-flap. I’ve done a short-row heel, but the heel-flap just seems sturdier to me. 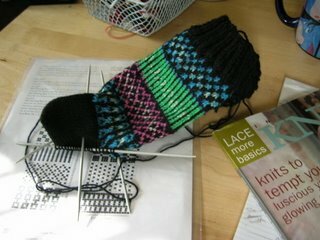 It is a great frustration of mine that 99% of all toe-up patterns (which I would dearly love to try) have short-row heels instead of flaps, but I know there are 1 or 2 out there that do make the attempt with heel-flaps, and therefore so will I. WHY DO ORDERS TAKE SO LONG!!?! You have an impressive sock history! With the black Kroy? I vote knitting them up in the Baudelaire, can you just imagine? Looking forward to seeing your dyed yarn! You get the no reply stuff on comments if the commenter isn’t signed in as a Blogger user. Blogger doesn’t ask for an email address when you comment as Other or Anonymous. You *could* set up the blog so that only registered folks can comment but that would cut a lot of people out from being able to comment. For instance, Lady O signed is as a blogger user, but neither marianne nor I did. If only registered users can comment we wouldn’t be able to. But that’s why some have email addresses and some don’t when you get notification. lady O – I am always so impatient with KnitPicks! And I can’t wait to try out this sock yarn dyeing escapade. Twig – thanks for this explanation. I’m still feeling my way around blogger! And I definitely don’t want to disallow non-Blogger people, so for now I suppose I’ll leave things as is.